On this date in 1792, Jacques Cazotte, a writer distinctly out of step with his times, was guillotined for treason in Paris. The Martinique-born Cazotte (English Wikipedia entry | French) was into his 40s when he launched the writing career that earns him notice enough for this blog. He wasn’t a liberte, egalite, fraternite kind of guy: Cazotte’s works, like Le Diable Amoureux (The Devil in Love),* were fantastical, Gothic — far from the rationalist fare of the Enlightenment. And that wasn’t exclusively a literary posture. Cazotte fancied himself gifted with prophecy — enthusiasts’ accounts have him prophesying the course of the Revolution — and preferred the mystical enlightenment of the illuminati to the Voltairean kind. ** He viewed the onset of the French Revolution with horror. When some scribblings to that effect were discovered in his papers, the mystical goose was cooked. The French Wikipedia entry credits his daughter with saving his life during the September Massacres … buying the 72-year-old only a few weeks of life. Cazotte finds his way to us, as the dark arts are wont to do, through more meandering channels as well. 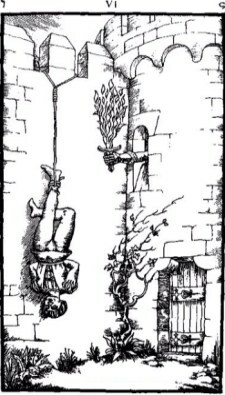 Although only tangentially related, this digression into the occult gives us leave to notice one of the many cultural ephemera of executions linked to no particularly blog-friendly date. The Club Dumas and The Ninth Gate make use of striking woodcuts of modern vintage but after a style of centuries past that help unlock the central puzzle. 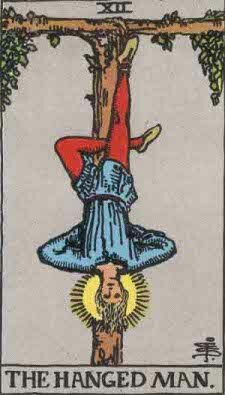 Charged with esoterica, the topical-looking “hanged man” print comes clearly modeled after its tarot cousin … although the tarot version, in most instances, is hoped to be of less deadly effect upon the plot. * Available free in the original French at Project Gutenberg. ** Voltairean rationalism had its own ways of getting in trouble. It may have been an age of ideas, but it was hardly safe to have them.